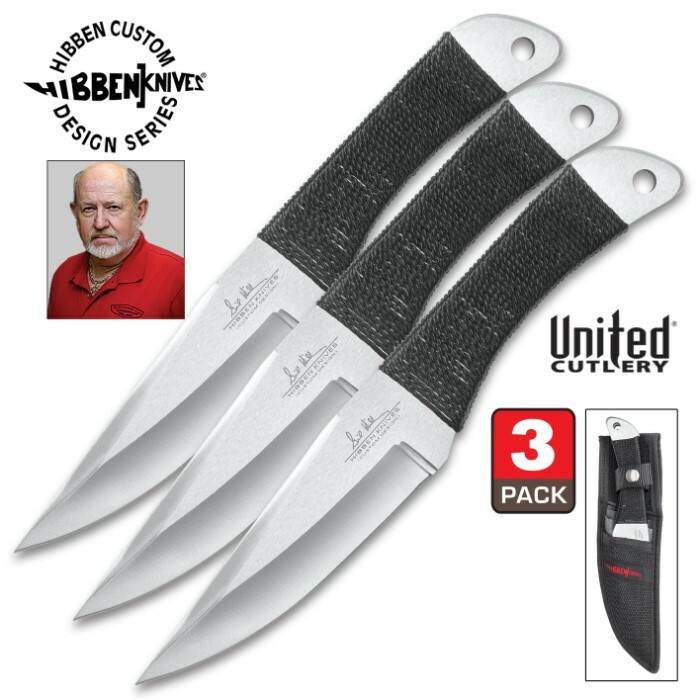 Gil Hibben – Tournament Throwing Knives, 3 Pc. Collection 8.5 In. Dominate your next tournament or your backyard knife-throwing session with these designer throwing knives designed by Gil Hibben. Each of these 8.5" throwing knives has a sharp edge and a piercing point for deep target penetration. The handles are wrapped in cord for a quality grip to help ensure accuracy with each release. The open-hole pommel design also contributes to a professionally balanced weight proportion for increased accuracy as well. Includes Hibben sheath. Awesome knifes for the money there strong balanced and I was hard on the knifes. I threw them horizontal and vertical and was not able bend or break the tip.the was very forgiving and sticks great, recommend to all.the cord does come off easy but you don't need it The knife takes a beating.l bought a few sets of these knifes,a lot of fun to play around with.great set of knifes for the beginners and experienced to practice with. The only problem I had was when the shipped the had a bent tip. But it only took a minute to file out. Overall I love them. strong knives I have had them for about 5 weeks and they are still sharp and tips do not bend. It got here quick. About the only bad thing on this set it the cord wrapping which comes off quick. I just pulled it off and wrapped it with camo tape. Well balanced throwers that are accurate and STICK super deep with just a light throw. I enjoy the sheath since most of my friends are envious of the fact i can carry 3 knives instead of one. well worth the cost and worth your time. REMEMBER TO PRACTICE! Knives are great!!! the only mistake i mad after getting them are throwing them at trees. that will dull the tip. other wise knives will barely bull if you throw at the right targets. But over all knives are GREAT!!! Glad I chose these out of all the sets offered at this site for my first purchase. Haven't had a chance to throw them yet but the quality, weight and balance please me completely. I love them, I just lost one in the woods :( best knives I got so far, don't worry about the cord it will come off anyway!! You think about it? Get them they are great, I had a few blade on blade hits and they are still good and solid. Also the tip is still very solid and I throw them 100 times a day for the last 2 months! Just take the Cord off!! Best throwing knife I got so far! I throw them on good 20ft will solid hits on the target, I love them very strong knifes. I had some blade on blade hits and they look still good, even the sheath is still alive! Top quality product! I have been throwing knives my entire life,and i'm a middle aged man. Gil Hibbons knifes are the best knifes I have ever thrown. The balance is perfect,I prefer cord wraped handles. You need to buy cord and rewrap the handles from time to time and I always use a little adhesive at the start of the wrap and tuck in at the end. This is necessary when throwing knifes with cord. Overall you will never find better throwing knifes than Gil Hibbons.